A “business-as-usual” approach with conservative spending will not solve the chronic agriculture crisis. We need a radical change in approach and more investment. Both the finance minister and later the prime minister spoke about the highest priority given to the welfare of farmers in the budget related speeches in the parliament soon after the budget was presented on 1st February 2017. The finance minister praised the role of farmers in ensuring food security in the country and expressed his intention to give back to our farmers “a sense of income security”. In his budget related speech, the prime minister reinforced the commitment of “doubling the income of farmers”. These are laudable objectives and reflect popular sentiment. We recognize that the task of improving incomes of farmers in India is an ambitious project and we need to see if the allocations made in the Union Budget for 2017-18 are sufficient to meet these promises. To understand the situation better let us reflect upon the reality of farmers and the budget provisions for agriculture in the Budget 2017 in light of similar provisioning in the budgets in the last four years. *Interest subvention was under the Finance Ministry but was shifted to the Ministry of Agriculture since 2016-17. Hence we have shown it separately to see the increase/decrease in the allocations. Two years of severe drought have hit the farmers very badly and the condition of farmers has been highlighted by the media and in many reports by civil society including Drought 2015-16: Lessons From Desolation. A public interest litigation (PIL) was filed in the supreme court on lapses in the response to the drought and the failure of implementation of many state entitlements including PDS, ICDS and MGNREGA and other food, fodder and water related schemes. Distress in rural areas led to sharp increase in migration being reported from many states. In another PIL in the supreme court on farmers suicides in Gujarat saw the apex court terming farmers suicides as ‘human rights violations’, and expanding the scope of the case and asking the union and state governments to explain “why the government had not yet formulated a national policy to protect the lives of the country's bread-winners”. Recent National Crime Records Bureau data show increasing numbers of farmers’ suicides reaching a staggering 3.21 lakhs – a tragic indicator of the plight of the farmers. Keeping this context in mind, it is clear that the ambition of improving the income security would mean addressing the agrarian crisis and would call for a more substantial intervention than the routine or adhoc allocations for various schemes under the ministry of agriculture. From this perspective a review of the current policy initiatives and budget allocations do not show enough provisioning for improving the incomes of farmers. For agriculture, budget 2017 is a story of big ambitions and low allocations. There are two ways to understand the Budget allocations. One way is to look at the allocations under a particular sector against the total union budget and another way is to look at allocations against the total gross domestic product (GDP). For the last five years allocations on agriculture have seen no big changes, staying within 2.1 to 2.25 percent of the total union budget and below 0.3 percent of the GDP. The allocation of Rs 51,026 crore in Budget 2017-18 represents 2.3 percent of the total union budget and also fall within 0.3 percent of GDP –showing no significant increase. The budget allocation for 2017-18 is an enhancement of 6.14 percent over the previous year budget (RE), a percentage increase that is much lower than the percentage increase during 2016-17, which was 37 percent. Going by a comparison with the past the current low level of allocations makes it difficult to expect any significant change in the fate of the farmers. Though there is some relief with good monsoons followed by good kharif crop yields. Farmers have faced distress again due to low prices realized in the markets. 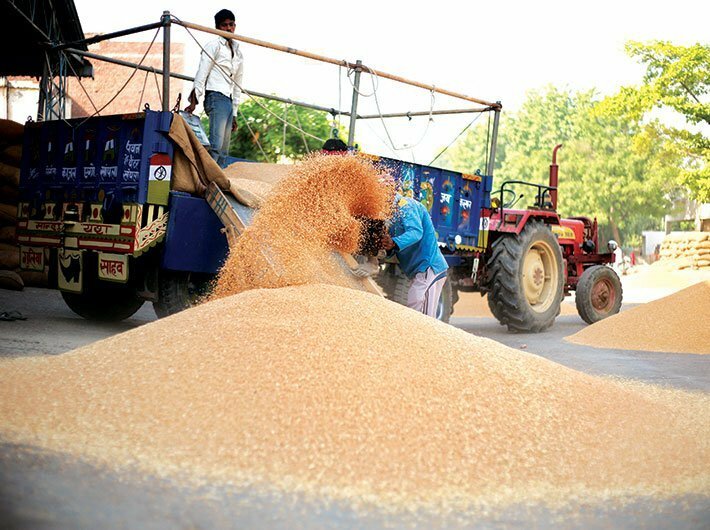 The minimum support price(MSP) of major crops like paddy and wheat have reported low increase of 4 percent to 6 percent, while prices of tomatoes, onions and pulses have collapsed. Budget 2017-18 has shown projected growth of 4.1 percent for agriculture sector. In the light of falling agriculture prices actually realised by farmers, this projection might be too optimistic as good yields may not translate into enhanced incomes to the farmers. Without significantly increasing prices and ensuring markets for agricultural produce, it is impossible to rescue the farmers from the crisis they face. The Budget 2017-18 does not promise increasing MSP nor does it speak about any other compensation mechanism for losses incurred by the farmers due to depressed prices. The price stabilization fund has been removed from the budget. The popular sentiment in favour of price compensation can be seen in the Krishi Budget presented by the Kisan Sansad organized at Jantar Mantar parallel to the Budget speech. The Krishi Budget proposed Rs 1,00,000 crore fund for ensuring Remunerative and Universal Price Yield Assurance (RUPYA) - a price compensation scheme. The Pradhan Mantri Fasal Bima Yojana (PMFBY), the flagship programme of the MoA has been allocated with Rs.9000 crores. This appears a significant increase when compared with the budget estimates of 2016-17, which was Rs. 5,500 crore. However, the revised estimates of 2016-17 budget shows much higher amounts -- Rs.13,240 crore. The 2016-17 revised estimates better represent the real requirement to cover the number of loanee and non-loanee farmers as per the objectives of the scheme. As per data from the Agriculture Insurance Company, the coverage of farmers has increased from 2.1 crore to 2.69 crore in case of loanee farmers and from 98 lakh to 1.01 crore in case of non-loanee farmers. If the target is to cover 9 crore agricultural households, the fund provisioning should be much higher than 2016-17 revised estimates. The MoA has written to the ministry of finance for allocation of Rs. 11,000 crore for covering the both loanee and non-loanee farmers last year. One of the most worrisome announcements of Budget 2017-18 is about contract farming. It is said that the central government will prepare a model law on this and encourage states to adapt it. The miserable experiences of Punjab on contract farming programme is well known. In fact the state has abandoned contract farming programme in 2012. Rather than taking steps in the interests of the small and marginal farmers who consist of 85 percent of the farmers, the central government appears to have taken the path of contract farming favoring the big investments. In case of MGNREGA we have witnessed efforts to discourage the programme by delaying the fund releases, which seriously impacted wage labourers during the drought period. The allocation of Rs.48,000 crores in the budget estimates of 2017-18 represents a growth over the previous budget, however if we compare against Rs.47,499 crore which are the revised estimates of 2016-17, the increase is insignificant and if we consider inflation rates, it represents a dip in real terms. If we were to consider the demand of the scheme, the allocations represent a huge gap. If the programme were to target covering 10.89 crore active workers with 40 days of work at the rate of Rs.170/- per day, the budget requirement would be more than Rs. 74,000 crore. If the target were to ensure 100 days work then the fund allocation is far behind the need. On the whole, Budget 2017-18 is discouraging in view of the serious agrarian distress on the one hand and the low allocations on the other. Also not much significant change can be seen in the nature and direction of policy in these allocations. A “business-as-usual” approach with conservative spending will not solve the chronic agriculture crisis. We need a radical change in approach and more investment.